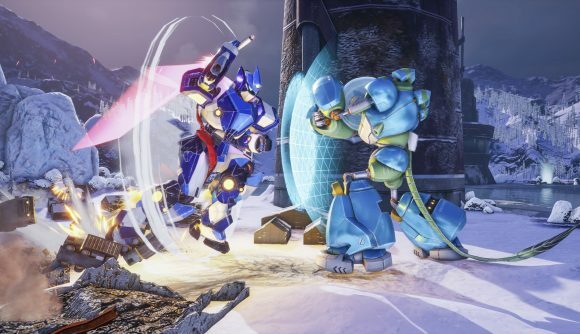 Override: Mech City Brawl looks like something I could get into. First of all, it’s about giant robots, and that’s points in its favor right there (see also: Pacific Rim). Secondly, it has a mechanical comedy element built right into the game: playing in co-op, players can each take control of one of their mech’s limbs, which I can already see making the game as much about shouting at (and hopefully with) your friends as committing combo inputs to memory. Override allows for several different co-op configurations, in fact. If there are three of you, one will act as pilot, one will control the legs, while the third is in charge of arm-related activities such as face-punching. It reminds me a little of Powerhoof’s Regular Human Basketball, but with more hitting and explosions. With enough coordination, you can pull off some pretty great moves – I don’t think I’ll ever get tired of one skyscraper-sized robot suplexing another skyscraper-sized robot. And each mech has its own unique ultimate ability, which you can trigger when your health gets too low. Here’s a trailer to give you a sense of how all this looks in action. Worryingly, the Steam page mentions “legendary skins” and other customization features, the developers tell me that players will earn all the cosmetics by playing – you’ll get something for competing in matches, with a chance at better rewards when you win, and loot boxes and microtransactions aren’t part of the picture. That all sounds fair enough to me, and really what I’m interested in most is watching large robots clumsily clobber each other. Override: Mech City Brawl will feature both local and online co-op and versus modes, plus a single-player campaign. It’s set to launch December 4, in time to play it with all the relatives you see over the holidays.